Figure A. RPE conjugated Mouse anti Bovine CD32 (MCA5918PE) and FITC conjugated Mouse IgG1 isotype control (MCA928F). Figure B. RPE conjugated Mouse anti Bovine CD32 (MCA5918PE) and FITC conjugated Mouse anti Bovine CD205 (MCA2450F). All experiments performed on red cell lysed bovine blood gated on lymphocytes in the presence of 10% bovine serum. Data acquired on the ZE5™ Cell Analyzer. Mouse anti Bovine CD205 antibody, clone IL-A114 recognizes bovine CD205 (also known as DEC205) and originally described as BoWC6. 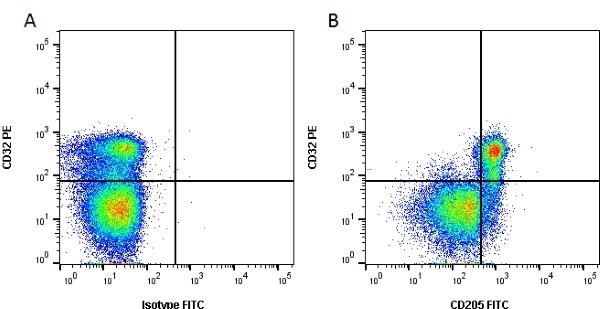 CD205 is a cell surface antigen with an approximate molecular weight of ~210-220 kDa. CD205 is expressed on afferent lymph dendritic cells (veiled cells), B cells, a subset of T cells and by cortical and medullary thymocytes. Spleen cells from immunized BALB/c mice were fused with cells of the X63.Ag8.653 myeloma cell line. Dutia, B.M. et al. (1993) Analysis of the monoclonal antibodies comprising WC6. Vet Immunol Immunopathol. 39 (1-3): 193-9. Parsons, K.R. et al. (1993) Studies of monoclonal antibodies identifying two novel bovine lymphocyte antigen differentiation clusters: workshop clusters (WC) 6 and 7. Vet Immunol Immunopathol. 39 (1-3): 187-92. Tamao, H. et al. (2011) Distribution of immune cells and expression of interleukin receptors in ileal Peyer's patches of calves. Cell Tissue Res. 346: 245-54.